Author George Lakoff explains how conservatives think, and how to counter their arguments. He outlines in detail the traditional American values that progressives hold, but are often unable to articulate. 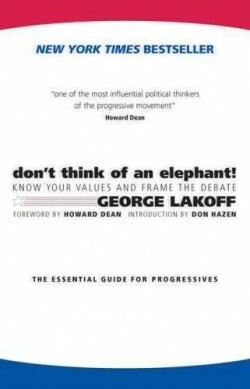 Lakoff also breaks down the ways in which conservatives have framed the issues, and provides examples of how progressives can reframe them. Lakoff’s years of research and work with leading activists and policy makers have been distilled into this essential guide, which shows progressives how to think in terms of values instead of programs, and why people support policies which align with their values and identities, but which often run counter to their best interests.